Reading Town Hall is best known for its landmark clock tower designed by Alfred Waterhouse. But behind the Waterhouse façade is an even older building of 1786, the Small Town Hall, now known as the Victoria Hall. It was restored in 1864 in Italianate style to accommodate the Father Willis Organ that had just been presented to the town by the Reading Philharmonic Society. 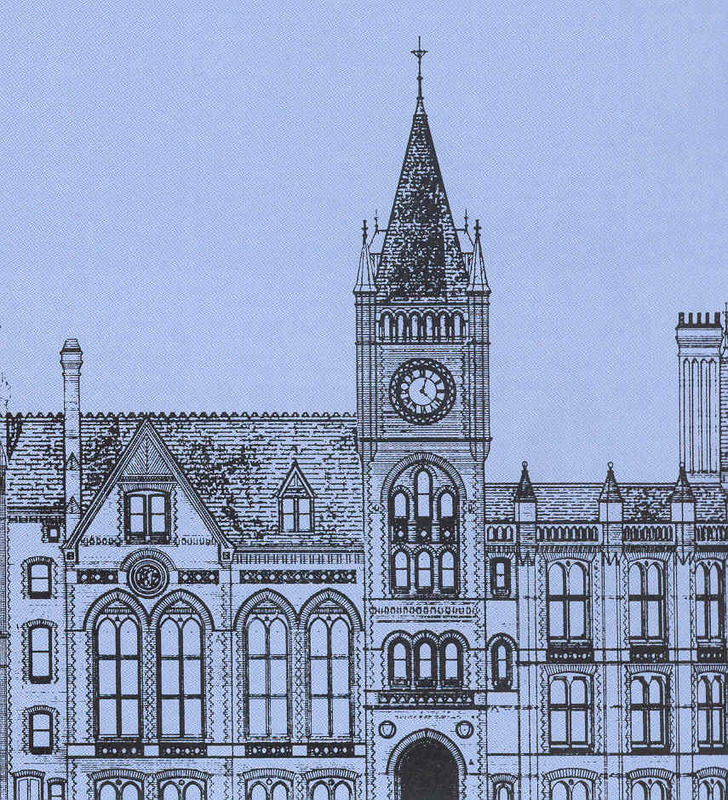 Waterhouse added the clock tower, council chamber, Mayor's rooms and offices in 1875. They are built of locally made red and grey bricks with terracotta panels. He skilfully wrapped his new building around the existing Small Town Hall, enjoying the challenge of a constricted site. His principle of design was to ‘first get your plan right – then the skyline – then fill in’. He then carefully placed the clock tower for views from Friar Street and Market Place. Waterhouse was one of the nineteenth century’s most important architects and lived at Foxhill, now part of the University of Reading Whiteknights campus. A few years later it was decided to add the Concert Hall, Museum, Library, and Science and Art School. Waterhouse was asked to submit a design, but it was too expensive. A design competition was held and won by local architect Thomas Lainson. The Father Willis organ was relocated and enlarged and the Concert Hall opened in 1882. The last addition to the Town Hall was in 1897 when the Art Gallery building by W.R. Howell was opened. In 1943 an air raid destroyed the southern end of Waterhouse’s building. Temporary repairs remained in place until the Town Hall was restored between 1989 and 2000. This restoration brought the Concert Hall and organ back into use and created new galleries for Reading Museum. The Town Hall façade has many fascinating details often overlooked by passers-by. The exterior of the 1882 Concert Hall and Museum has a frieze of Corshill stone originally intended to show the principal events of Reading’s history. Eventually only one panel designed by Charles William May was carved showing the foundation of Reading Abbey in 1121. In the gable above is a stone niche with a marble statue of Queen Victoria by F.G. Anstey. This was commissioned by William Isaac Palmer, a founding partner of Reading’s world famous biscuit company Huntley & Palmers. The corner of the 1897 Art Gallery has a terracotta frieze made by Reading brick makers S & E Colliers. The first panel shows ancient British life including an Iron Age blacksmith. The second panel depicts scenes of Roman life. The third panel features Tennyson, Shakespeare, Burns, Milton, Chaucer, Homer and Dante, while the final panel celebrates nineteenth century scientific achievements such as Edison’s telephone. Welcome to Reading UK - a cultural place, business space and living base.